The fortunate students of the Umbra Institute’s Renaissance Art course got what few who visit Florence receive: a professional tour that, in two days’ time, visits all of the major sites. What could be better? How about an expert in the field, noted Renaissance Art scholar Adrian Hoch. 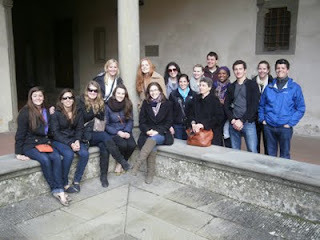 Professor Hoch’s class made its way from the Uffizi (Botticelli, Adriano da Fabriano, Leonardo, Michelangelo) to the cathedral, sacristy, and refractory of Santa Croce before closing the day with the Capponi Chapel. Day Two featured the Brancacci Chapel, Santo Spirito, San Marco (Savanorola’s cell and hair-shirt were on display), and finally, fittingly, the David. At Umbra, students don’t just study art: they get right into it. Coming up is Professor Hoch’s Leonardo field trip to Milan to see the Last Supper.